Chang'an Restaurant is a modern Chinese restaurant and bar in a San Gabriel strip mall. The space features a contemporary configuration of brick, wood and steel. Share-friendly dishes include beef tataki with capers, garlic, and pine nuts; beef and lamb skewers served with herbaceous dips; and Szechuan-style boiled fish and frog. Among desserts are white fungus soup with lotus seeds and osmanthus rice balls swimming in sweet rice wine. To drink, Chang’an has gathered an eclectic menu of lagers from around the world. Lunch & Dinner daily. Chang'an Restaurant, 227 W. Valley Blvd., San Gabriel, CA 91776, 626-872-0906. The Greenhaus Cafe & Bakery resides next to San Gabriel Country Club, on a stretch that's otherwise dominated by Asian restaurants. The space features a green and white color scheme and wood accents. Executive chef Jason Francisco presides over a menu that covers three meals daily. For breakfast, expect fried chicken and waffles, a breakfast burrito and a breakfast skillet with eggs, bacon, two cheeses, tater tots and more. Later in the day, options include The Haus burger with sambal aioli and gremolata fries, creamy penne pesto and a soft-shell crab sandwich. Pastry chef Wendy Mendoza fills a case with chocolate chip cake, donuts and salted caramel cupcakes. Breakfast, Lunch & Dinner daily. The Greenhaus Cafe & Bakery, 510 E. Las Tunas Dr., San Gabriel, CA 91776, 626-286-3788. Premier Dessert Kitchen built on the success of their original Arcadia location by expanding to El Monte. The space features lime-green walls, a tile-fronted counter, high-backed booths and white tables. Beverages are their strength, including options like rose green tea latte, tropical fruit tea and potted milk tea, a drink that resembles a potted plant. Full-scale desserts include mango crêpes, tofu-custard cheesecake and a cantaloupe shaved ice mountain. Savory options include chow fun, bacon-wrapped enoki mushrooms, and beef noodle soup. Lunch & Dinner daily. Premier Dessert Kitchen, 10514 Lower Azusa Rd., El Monte, CA 91731, 626-350-1988. Sushi chef Kazunori Nozawa and team have added a SUGARFISH by Sushi Nozawa location in Pasadena's South Lake shopping district. To keep costs down, SUGARFISH makes all food in back from a limited menu. A la carte sushi, sashimi and rolls are available, but many people submit to "TRUST ME" menus. The Nozawa provides the most deluxe selection, with courses that include tuna sashimi, snapper sushi, a blue crab hand roll and the daily special. This Pasadena location features a primarily grey color scheme, with wood accents and bulb lanterns. Lunch & Dinner daily. SUGARFISH by Sushi Nozawa, 146 S. Lake Ave., Pasadena, CA 91101, 626-298-8386. Seasoned restaurateurs Jason Park and Jinney Baik, who previously teamed on the original Sunset Strip Poke Bar, expanded to Poke Bar Studio City this fall. The fast-casual concept features a predominantly orange color scheme. An overhead menu allows customers to choose their base, which could be white rice, brown rice, salad or nacho. Each order comes with at least two different scoops of poke, which means proteins like tuna, scallop, shrimp or tofu. From there, choose your favorite flavor, possibly ponzu, sweet chile or wasabi mayo. Lunch & Dinner daily. Poke Bar, 13203 Ventura Blvd., Studio City, CA 91604, 818-386-9495. Blaqhaus is open in North Hollywood. The space features a black and white mural that depicts classic L.A. imagery, including movie cameras, the Hollywood sign and the Capitol Records building. The menu showcases internationally inspired comfort foods like Dodger Bleu burgers, Straight Outta NoHo waffle fry nachos, and Oreo ice cream sushi rolls for dessert. Greens and flatbreads round out the eclectic menu. To drink, choose from soft drinks, coffee, tea and a lemonade of the day. Breakfast, Lunch & Dinner daily. Blaqhaus, 11665 Victory Blvd., North Hollywood, CA 91606, 818-980-5500. Musician/DJ Moby has opened Little Pine, an organic, vegan bistro in Silver Lake. Little Pine, 2870 Rowena Ave., Los Angeles, CA 90039, 323-741-8148. Otium is a project from Sprout LA restaurant group. The downtown Los Angeles restaurant features contemporary wood-fired fare from chef Timothy Hollingsworth, the former chef de cuisine of The French Laundry who also collaborated on Barrel & Ashes in Studio City. Otium is set in a freestanding building adjacent to The Broad museum on Bunker Hill. The nearby kiosk Otium On the Go is open 10 a.m.-4 p.m. Tues.-Sun. Otium, 222 S. Hope St., Los Angeles, CA 90012, 213-935-8500. Sushi Roku’s Hollywood location closed in October to make way for a new IDG flagship restaurant, ROKU, featuring fresh Japanese creations utilizing a test kitchen and a room for teppanyaki cooking. Lee Maen, partner/founder of Innovative Dining Group, states, “ROKU will blend some of the core sensibilities from Sushi Roku Hollywood with our evolving signature style, in order to offer something new and cutting edge for today’s discerning guest.” ROKU, 9201 Sunset Blvd., West Hollywood, CA 90069, 310-278-2060. Chef Phillip Frankland Lee, who’s already found San Fernando Valley success with The Gadarene Swine, is opening Scratch Bar & Kitchen in Encino. This reincarnation of his tasting bar concept, which he runs with pastry chef/wife Margarita, will be on the second floor of Encino Place. Expect a debut on December 1, 2015, which coincides with his appearance on “Top Chef: California.” Chef Lee previously won on “Chopped,” “Cutthroat Kitchen” and “Guy’s Grocery Games.” Scratch Bar, Encino Place, 16101 Ventura Blvd., Encino, CA 91436, 818-646-6085. 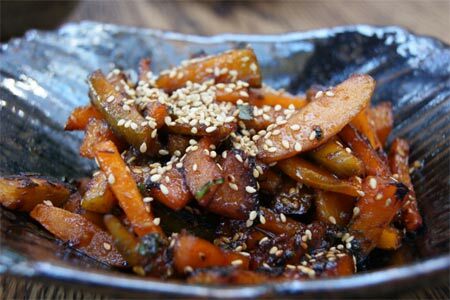 Fast-casual Korean restaurant Oleego, from chef Jenee Kim, which started in downtown L.A. and also operates in Chinatown, is now open in Sherman Oaks' Westfield Fashion Square mall. The name means “lay on” in Korean. Choose from eight proteins, including galbi (short rib), chicken bulgogi and shrimp, and lay your selection on either rice, fried rice, noodles or greens. Choose a sauce, either Oleego soy, spicy soy, bean paste or Oleego hot, and commence eating. Grab your black tray from the sleek white stall and retreat to a nearby table in the mall food court. Lunch & Dinner daily. Oleego by Park's BBQ, Westfield Fashion Square, 14006 Riverside Dr., Sherman Oaks, CA 91423, 818-501-9092. Sangers & Joe is serving up breakfast, lunch and brunch in Old Town Pasadena. The café’s name comes from “Sanger” (Australian slang for sandwiches) and “Joe” (as in coffee). Also on offer are salads, panini and deli-style sides like red quinoa with cucumbers. Sangers & Joe, 57 E. Holly St., Pasadena, CA 91103, 323-553-0563. Golden Road Brewing will open a tasting bar at downtown's Grand Central Market. Patrons can expect pierogies and more than a dozen beers on tap at Golden Road Grand Central Market. Golden Road Grand Central Market, Grand Central Market, 317 S. Broadway, Los Angeles, CA 90013, no phone. The Rose Café in Venice has been revived and is now called Rose Café-Restaurant. 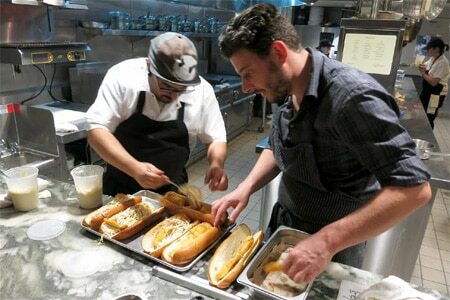 Partner and executive chef Jason Neroni directs the culinary team for all-day offerings. 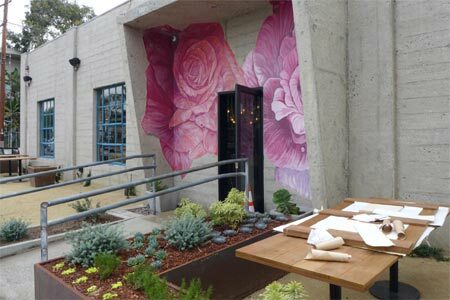 Rose Café-Restaurant, 220 Rose Ave., Venice, CA 90291, 310-399-0711. Chef Bruce Kalman (Union) will open Knead & Co. Pasta Bar + Market at the Grand Central Market in downtown L.A. The pastas will be made with small-batch flour from Grist & Toll in Pasadena. Knead & Co. Pasta Bar + Market, Grand Central Market, 317 S. Broadway Ave., Los Angeles, CA 90013, 213-624-2378. Chef Chris Oh (Seoul Sausage Co.) and restaurateur Stéphane Bombet (Terrine, Faith & Flower) have opened Hanjip, a modern Korean BBQ restaurant, in Culver City. A downtown L.A. location, at Seventh Street and Spring Street, is also in the works. Hanjip, 3829 Main St., Culver City, CA 90232, 323-720-8804. Sidecar Doughnuts has set up shop in Santa Monica. The doughnuts are fried in small batches each hour and come in seasonal flavors like Lemon & Thyme. Sidecar Doughnuts, 631 Wilshire Blvd., Santa Monica, CA 90401, 310-587-0022. Chef Alex Ageneau has departed aestus. He has stepped in as executive chef at Petrossian Boutique & Restaurant, taking over from Giselle Wellman. aestus, 507 Wilshire Blvd., Santa Monica, CA 90401, 424-268-4433. 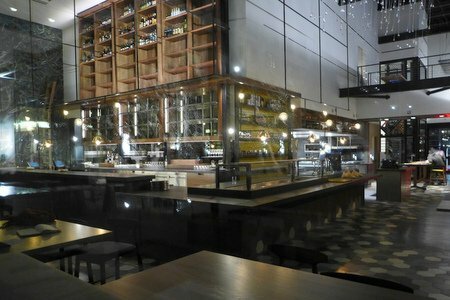 Seasons 52 at Westfield Century City has closed. Seasons 52, Westfield Century City, 10250 Santa Monica Blvd., Los Angeles, CA 90067, no phone. Colonia Taco Lounge has closed its La Puente location and will move to Whittier in November 2015. 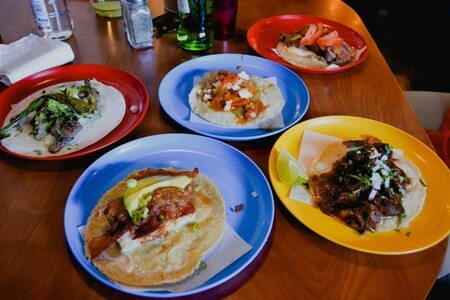 Colonia Taco Lounge, 13030 E. Valley Blvd., La Puente, CA 91746, no phone. Hollywood seafood restaurant littlefork closed November 1, 2015, to make way for a pop-up of Nashville-themed Howlin’ Ray’s Hot Chicken, which will feature a whisky-centric cocktail menu. littlefork, 1600 Wilcox Ave., Los Angeles, CA 90028, no phone.